The Louisiana State Auditor's office is located in the First Circuit Court Building. Our purpose is to help ensure that government is responsive to the needs of the people of Louisiana – a government that is accountable, efficient, and effective. As one of the Legislature’s most objective resources, we provide independent assessment and proactive guidance, resulting in accurate reporting of the fiscal condition and performance of government and the sources and uses of its financial resources. We are an excellent resource in matters ranging from local fiscal issues to the State’s Comprehensive Annual Financial Report (CAFR). 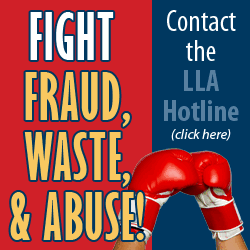 Contact the Louisiana Legislative Auditor (LLA) Hotline if you suspect the misappropriation (theft), fraud, waste, or abuse of public funds by anyone. Information provided to the LLA Hotline may result in an investigation, audit or other review. When providing information to the LLA Hotline, please include sufficient detail (describing who, what, where, when, why, and how) to allow us to fully evaluate your information. Although we will consider anonymous information, providing us with your name and telephone number will allow us to contact you with any additional questions that we have.